Dodge Ram's back seats were removed and replaced with two bucket seats that spin around. There are also 20-8 inch MA woofers and 32 inch LCD screens in the center complete with a satellite dish on top of the truck. 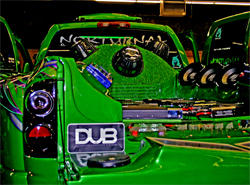 DUB Magazine hosted the D-DAY L.A. automotive festival in San Bernardino, California. Hip hop artists were on the stage and car enthusiasts walked among some of the most tricked out cars, motorcycles and trucks at the National Orange Show Events Center. K&N products were under the hood of Scions, Dodge Magnums, Chryslers, GMC Sierras and many other vehicles. K&N products were also in plain view on some of the award winning modified Harley Davidson motorcycles. 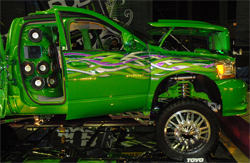 Then, there was the award winning 2004 Dodge Ram diesel 4X4 dualie owned by Tony "Scooby" Reynaga of Bakersfield, California. Reynaga originally bought the 5.9 liter truck with a Cummins motor as a stock vehicle. He decided to modify it and now his Dodge will be on display as a 2009 SEMA (Specialty Equipment Market Association) feature vehicle. 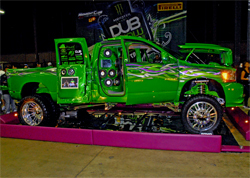 "This was the first 4X4 to win 2009 Best of Show by DUB in San Jose, California," said Reynaga. "I've made a lot of changes, but now I'm almost satisfied with the way it looks." The Dodge Ram has suicide doors that open backwards at 90 degrees, relocated door handles and no rear bumper. "We put a roll pan in place of the bumper," said Reynaga. "We also shaved off all of the bed pockets." Reynaga replaced the front bumper and hood of his 2004 Dodge Cummins with the front end from a 2007 Dodge Ram 1500 SRT-10. There is also a very large T-Rex mesh grill. "I iced out Noktastrophe on the top of the grill," said Reynaga. 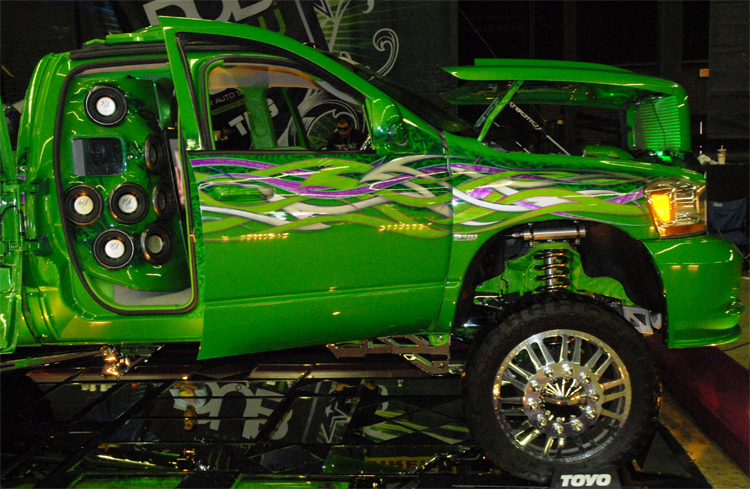 "Trends Custom Painting did the whole belly of the truck and also put graphics on the frame. 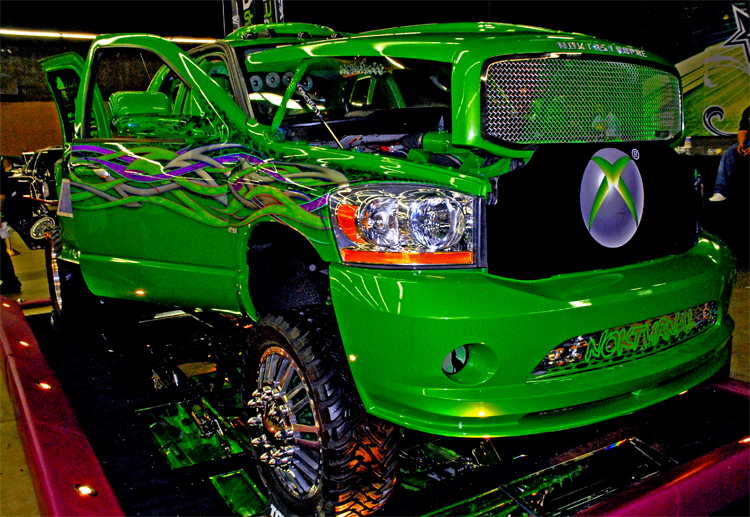 The lift is also chrome plated." Reynaga is also the President of the Bakersfield Chapter of the Nokturnal Car Club and would not rest until the inside was tricked out. 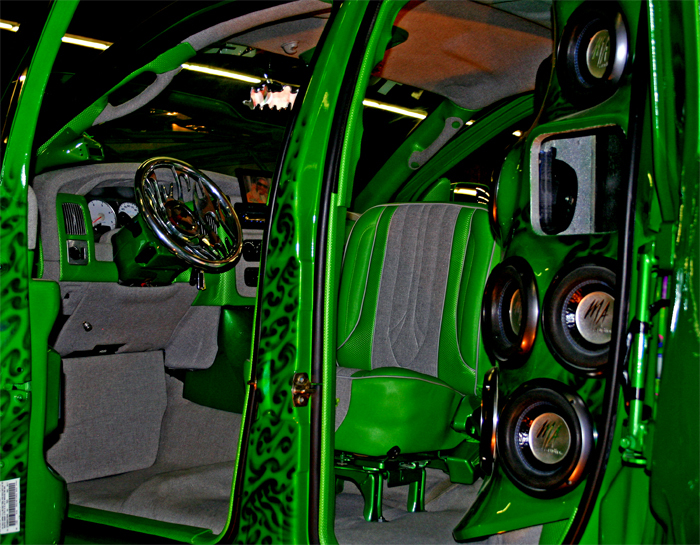 "We got rid of the front and back seats and installed two bucket seats that spin all the way around," he said. "The interior was done in tweed and marine materials by Alfredo. As for the stereo, we went a little crazy." 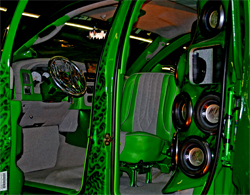 There are 20-8 inch MA woofers inside the vehicle. "In the center of all the subs there are 32 inch LCD screens and we have an Xbox 360. I couldn't stop there. 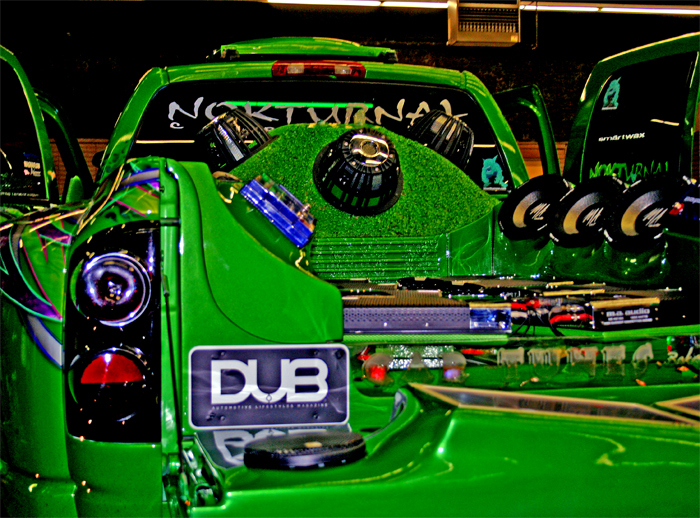 In the back of the truck bed we have 10 more MA woofers and 8 floating amps." Reynaga does mean floating. There is a working waterfall complete with more than 100 gallons of water cycling through a fountain. The wheels are 24 inch American Force Freedom wheels. "We wrap the wheels with 37 inch open country rubber from Toyo. People tell me it looks nice but want to know if I can drive it. It shows and it goes." 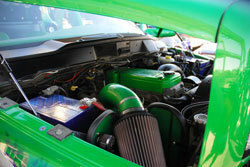 Reynaga installed a K&N air intake system for more power. 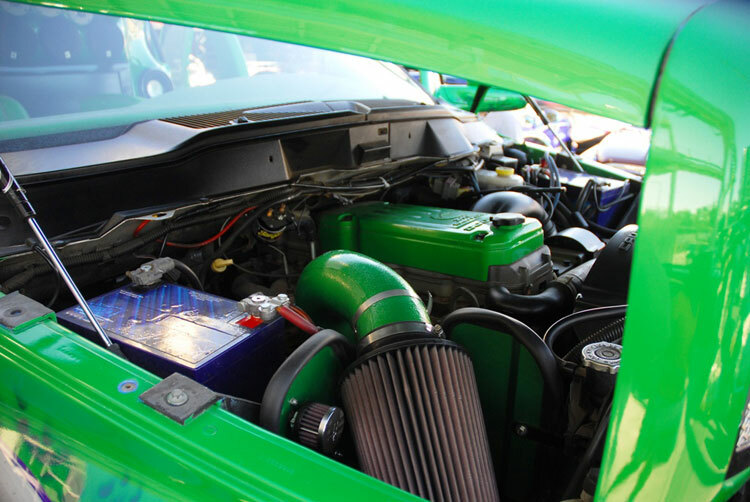 "The first thing I did was put a K&N air intake kit on my truck," he said. "K&N opened it up immediately. I got more power and acceleration. I also painted the intake tube to match my truck. I use K&N on my vehicles." 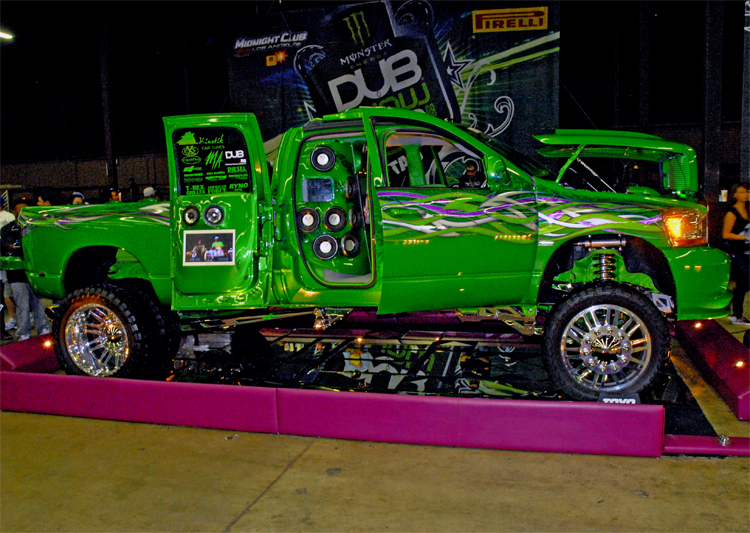 The truck was a show stopper at the DUB show. Crowds gathered to see all the details. "I want to thank all my sponsors," said Reynaga. "But the biggest thank you is to my wife who let me spend long nights working on my truck." 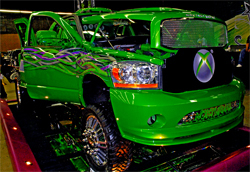 "I never say I'm done when it comes to modifying a vehicle," said Reynaga. "I may wake up tomorrow and start all over again. This is more than a hobby, it's my job."